The ANGLAM CC is a new signature edition produced together under Hiroyuki Suzuki's brand sOMEThING and their new team member - the Amazing Christopher Chia! 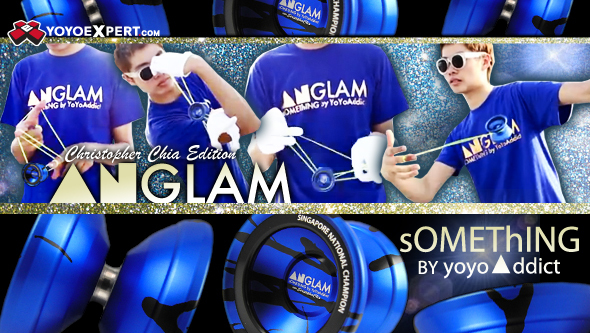 ANGLAM CC is a mid sized 6061 aluminum yo-yo that fits wonderfully in the hand has everything you are looking for in a competition level yo-yo. Christopher took the ANGLAM to a new level by modifying the overall shape and changing the weight distribution to fit his style and increase playability. sOMEThING is utilizing an all new weight ring system made from a secret heavy metal that not only makes the yoyo cheaper in price but doesn't lose any play in the process! ANGLAM CC is equipped with a large CBC Center Trac Bearing and 19mm slim pads for tight binds. Features ANGLAM logo engraved on both sides as well as Christopher Chia's signature right below it for a really great look!